Hexagons are one of the popular motif shapes. You can use your motifs for blankets, scarves, cushions or whatever you like really. 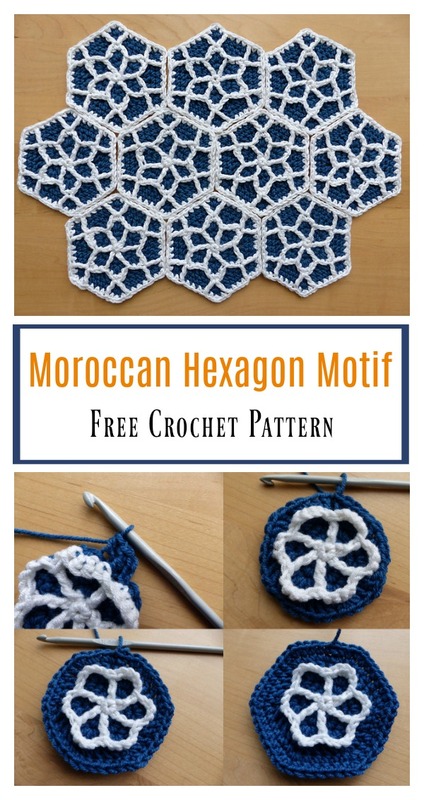 The beautiful Moroccan Hexagon Motif Free Crochet Pattern is easy to make with detailed photo instructions. If if you can crochet a granny square, then you can easily make one of these. It’s done in brilliant color combinations, but you can pick any other your favorite colors. You can be creative and use the motif for any other creative project they can imagine.Thanks Make My Day Creative for sharing this free pattern. The link for the free pattern is provided below photo. Happy crocheting.